– Cycling enthusiasts, from pro to weekend warrior, are invited to experience the premier boutique wine country ride on the Central Coast, happening Saturday October 10, 2015, starting and ending in the Templeton Community Park. Come enjoy the beautiful scenery and outstanding terrain on three different routes: a 30-mile, a 62-mile Metric Century and 100-mile Century, which all meander through the vineyard-studded back roads and gentle rolling hills of Templeton, Creston and Paso Robles. The Central Coast offers some of the best rides available to cyclists. When finished, come celebrate with a scrumptious BBQ and enjoy premier wines from Wild Horse Winery and a cold 805 beer from Firestone-Walker Brewing Company. Afterwards, enjoy the beautiful Templeton downtown park and explore our quaint downtown with unique shops and amazing eateries, all located just minutes away from a host of world-class wineries. On Friday, October 9 there will be a pre-registration reception at the Templeton Chamber office, with wine, appetizers, and registration check-in, allowing participants to hit the road the next morning without delay. 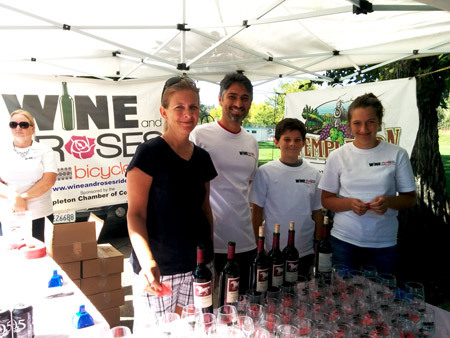 The Templeton Wine and Roses Bicycle Ride is limited to 350 participants and fills quickly. Registration opens April 1, 2015 at www.wineandrosesride.com.